Well, YELP’s moment of truth comes tonight, with their Q3 earnings report. The options market is implying about a $6 move in either direction or about 13.5%. 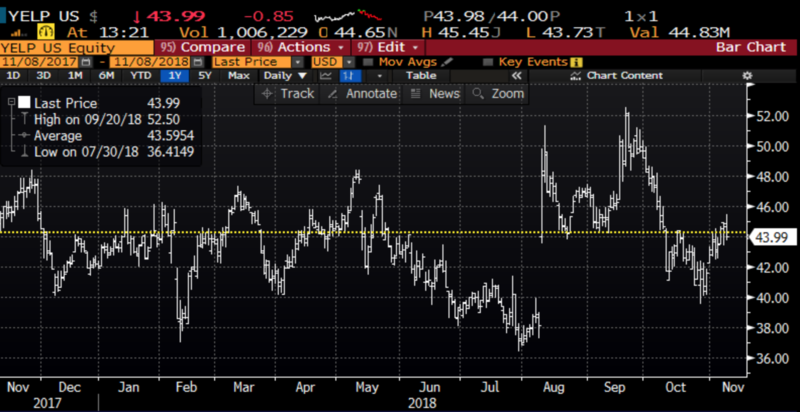 If you bought the Nov 9th at the money straddle (the call premium + the put premium) or the implied move into earnings, you would need a rally above $50, or a decline below $38 to make money by tomorrow’s close. If the stock is $40 or higher on tomorrow’s close the Nov 9th weekly 40 put will expire worthless and you would be left long the Dec 40 put for only 60 cents. Depending on where the stock is, this put will have gained or lost value with the ideal scenario the stock being nearing $40, the Dec 40 put will lose some extrinsic value as options prices moderate but will also pick up value in deltas as it gets closer to the put strike. The worst case scenario is the stock having the sort of rally it did last quarter, or down well below the 40 strike, but under those scenarios, the premium at risk is just 60 cents, or less than 1.5% of the stock price. If the stock were to decline, but be above the 40 strike, then you could consider selling a lower strike put in Dec and making a vertical put spread playing for lower lows.